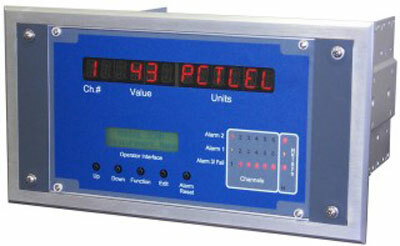 The R. C. Systems Co., Inc. Model ST-35 Display / Alarm Controller is designed to provide simultaneous display and alarm functions for up to 6 input variables. Three adjustable alarm levels are provided for each channel. Relay outputs allow control of beacons horns and other alarm events. Analog inputs may be accepted and conditioned via sensor specific analog input cards. Alternatively, the standard Modbus Master port allows input data to be retrieved from Modbus slave devices including the many Modbus compatible R. C. Systems Co. Inc. sensor transmitter products. The ST-35 is easy to configure and user friendly. Large LED characters indicate channel #, engineering units and values. A 2 x 16 LCD readout provides operator interface and diagnostic functions. Measurement ranges in engineering units, adjustable alarm set-points, dual serial interfaces and many other features combine to allow the ST-35 satisfy the needs of many difficult applications. It is widely used for centralizing the display and alarm processing functions in critical multipoint monitoring applications. These include monitoring of ambient gas detection, rotating machinery tank levels, flow, temperature and others. A RS-485 Modbus slave port allows up to 128 ST-35's to be multidropped onto a single data highway for interrogation by another Modbus master. ST-35’s may also be cascaded by connecting one unit’s master port to another’s slave port. ST-35 options such as discrete alarm relays per channel, 4-20mA I/O, direct sensor input conditioning and others are added by connecting to the economical I2C expansion bus. Familiar “telephone style” cables and connectors interface to this bus. This method allows versatile system configuration of options satisfying the most unusual user applications. Nonvolatile memory retains all configuration data indefinitely. Accepts up to 6 inputs from many different sensor types and signal ranges. Inputs may be analog, or Modbus® Master capability allows input data to be retrieved via RS-485 data highway reducing wiring costs at installation. Approvals include CSA certification and the "CE Mark". Dual Modbus serial ports for simultaneous master / slave operation. 3 independent alarm levels per channel. Relay Acknowledge feature allows silencing of external audible devices during existing alarm conditions. Standard A SPDT common alarm relays for Horn, HIGH, WARN & FAULT. Optional discrete channel alarm relays also available. Options such as direct sensor inputs, 4-20mA outputs, discrete alarm relays and others are supported via an I2C expansion bus. Cal Mode offers pushbutton zero / span calibration for direct sensor interface applications. Authorization Mode allows locking of critical configuration variables. Magnetic keypad available for non-intrusive operation in potentially hazardous locations.